Contents: Marvel Team-Up #76 (December 1978) to #78 (February 1979), and #80 (April 1979) to #98 (October 1980), and Marvel Team-Up Annual #2 (1979) and #3 (1980). Overview: Living in New York City, Spider-Man has the opportunity to cross paths with many different heroes from all corners of the Marvel Universe. A casual stroll through Greenwich Village usually prompts an encounter with the mystical Dr. Strange. Being sent on a photo shoot for the Daily Globe allows Peter to meet up with the Invisible Girl. And you just never know when Howard the Duck might drive his cab from Cleveland to Manhattan. 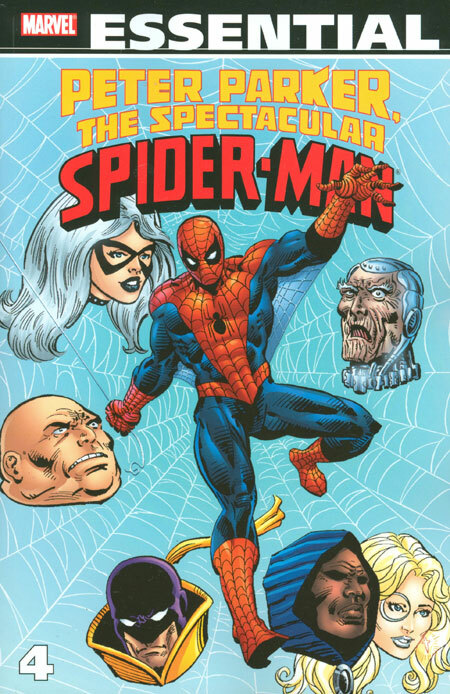 While references are made to ongoing events in Spider-Man’s other monthly books, these stories usually follow the one-and-done format, giving the reader a complete story within the 20-plus pages per issue. These stories also tend to be more lighthearted, giving into the absurdity that brings some of these team-ups together. What makes this Essential? : The team-up books, such as this or Marvel Two-in-One, are a good way to read a particular character, be exposed to a variety of other characters, and not get bogged down in continuity from the main character’s books (usually). While mostly one-and-done stories, there are a couple of mini-story arcs (#76, #77, #80, #81; and #82-#85) that make for more interesting stories. While this is not a must-read volume to understand Peter Parker, this is a friendly way to introduce a new reader to the world of Spider-Man. 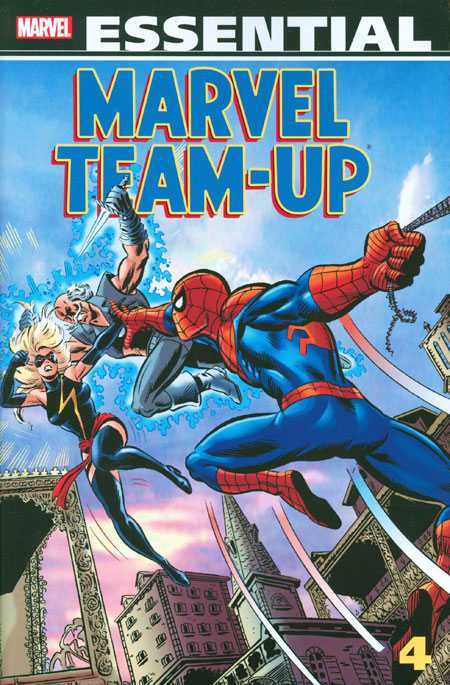 Footnotes: Marvel Team-Up #79 is not included in this Essential volume. That issue teamed Spider-Man up with Red Sonja. Marvel no longer holds the rights to publish Red Sonja, so it could not be included in this Essential. If you like this volume, try: the first Hawkeye mini-series from 1983. We see Hawkeye in Marvel Team-Up #92 working as the security chief for Cross Technological Enterprises (CTE). Hawkeye would work for CTE during his many leaves of absence from the Avengers. The mini-series brings the CTE storyline to a conclusion, as Hawkeye discovers that the cousin of CTE’s CEO is the villain Crossfire, who is hatching a plan to destroy all superheroes. Working with former S.H.I.E.L.D. agent Mockingbird (first introduced in Marvel Team-Up #95), Hawkeye stops Crossfire’s plan. The series ends with Hawkeye and Mockingbird getting married. This series has been collected in a trade paperback and as a Marvel Premiere edition. Overview: He’s back in black — or sometimes red & blue. It’s the Amazing ….. no, that’s not right …. let’s try the Spectacular …. no, still not working here. Guess we better give the Web of Spider-Man a try! Web 0f Spider-Man replaced the previously canceled Marvel Team-Up on the stands. We were still getting three new Spider-Man titles each month, just with fewer guest appearances. That’s not to say we don’t see guest stars in this collection – from the New Mutants to Dominic Fortune to David Letterman, this book has a little bit of everything. These issues take place a few months following the Secret Wars event. Spider-Man is still haunted by the symbiote that returned to Earth with him. 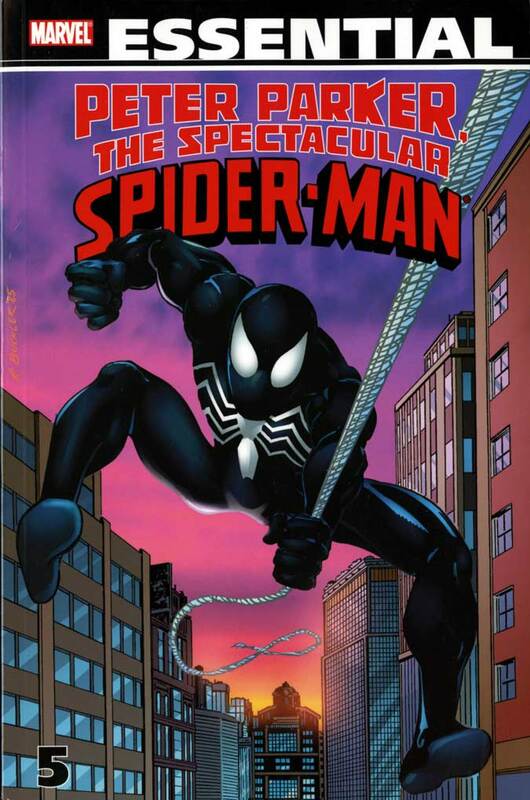 The series kicks off with Spidey fighting the symbiote, long before it would attach itself to Eddie Brock. A host of other familiar Spider-Man foes, such as the Vulture, Doctor Octopus, and the Shocker, soon follow. Two longer stories really stand out in this volume. The first is a crossover with Amazing Spider-Man (complete with interlocking cover images) that ties into Secret Wars II. The Beyonder has turned a New York City building into gold, and the government, aided by the Kingpin, is in a mad scramble to remove the building before it destroys the economy. Spider-Man is more concerned about the people trapped inside, and gets upset when he realizes that the Kingpin is going to profit from this event. Spider-Man swings off with a gold notebook, which leads to the ethical questions of what he should do with it while also trying to find a way to unload it too. Another ongoing story that crossed multiple issues featured Peter Parker as a neighborhood hero. Peter stops a mugging at the laundromat, earning him praise from his neighbors and the media. But the thugs he stopped come back to target Peter, vandalizing his apartment before eventually firebombing his place. Peter struggles to deal with these problems without reverting back to his costumed identity. What makes this Essential? : This is a title that I read sporadically as it came out. I just didn’t have much interest in Spider-Man at this time. 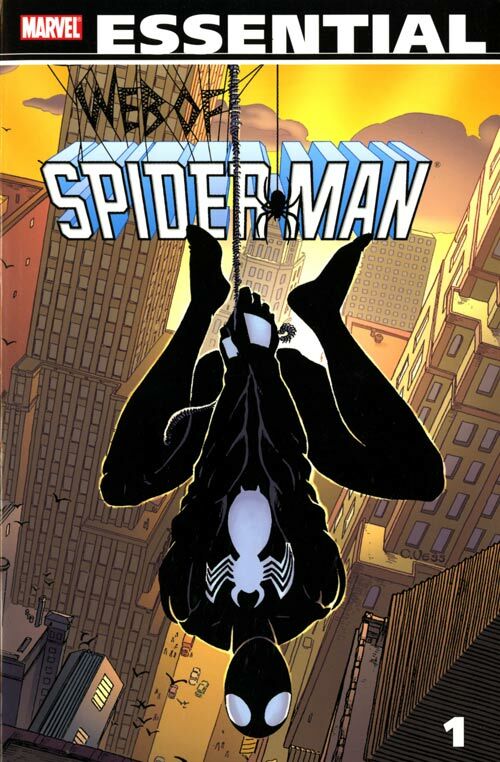 The problem I have with this book, and I think Marvel has realized it at different times along the way, is that there is nothing unique to this book that distinguishes it from Amazing Spider-Man or PPTSS. 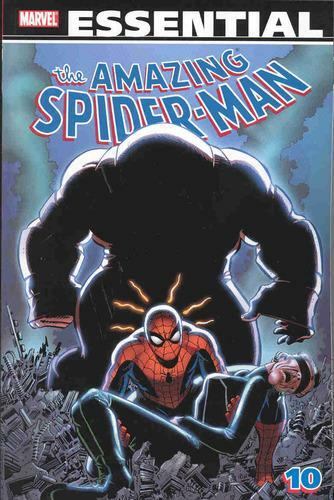 There are several issues or moments that stand out in this book, such as Peter’s conversation with Flash Thompson about the high school bullying in issue #11 or Spider-Man chasing Warlock through New York City in Annual #2. But the highs don’t offset the lows in this collection. Maybe low is too harsh. The better word might be pedestrian or average. 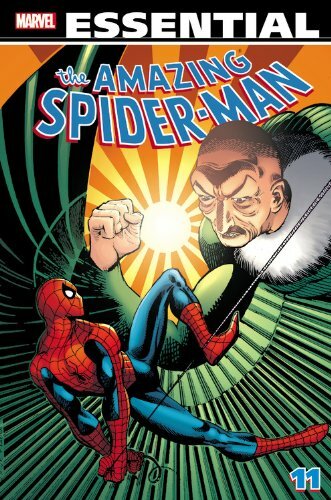 For the Spider-Man fan, I’m sure you will like this book. For the casual Marvel fan, you might consider other volumes first before this collection. Footnotes: Web of Spider-Man #replaced Marvel Team-Up on the newsstand. Marvel editorial took a good look at the sales figures and realized that the numbers for Marvel Team-Up rose or dropped based on the co-star. 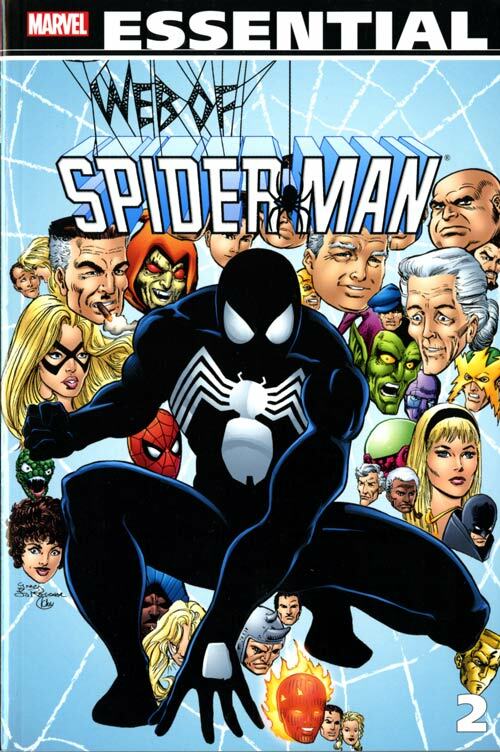 Editor-in-Chief Jim Shooter surmised that Marvel would be better off publishing a third Spider-Man solo title, and work in guest-stars when they were appropriate for the story. If you like this volume, try: the original Marvel Super-Heroes Secret Wars. This volume has the two-part story that was tie-ins to the Secret Wars II event going on. I am not recommending you go out and read Secret Wars II. Trust me, having read it as it was happening, I have no desire to revisit Secret Wars II anytime soon. But I do go back and revisit the original Secret Wars every couple of years. Yes, this book was created specifically to sell toys. Lots of comics got their start that way, such as G.I. Joe and Transformers. But Marvel took the opportunity to make it a meaningful story, one that would have impacts on the Marvel Universe for years to come. The way the timing happened, we knew what those changes would be as the heroes returned to Earth in the comics that were released one week after Marvel Super-Heroes Secret Wars #1. The biggest change is that Spider-Man returned wearing that spiffy black costume that reacted to his thoughts. What he soon found out is that the suit was an alien symbiote, and the Fantastic Four helped Peter separate himself from the symbiote. In Web of Spider-Man #1, we see the symbiote on the loose, tracking down Spider-Man. At the end of this volume, in Web of Spider-Man #18, we see a mysterious hand push Peter into the path of a subway train. Peter’s spider sense did not warn him, which is one of the advantages that Venom would have over Spider-Man when he made his full proper first appearance in Amazing Spider-Man #300. In addition to the Spider-Man costume, Secret Wars also gave us She-Hulk joining the Fantastic Four, and the Thing staying behind on the Battleworld. The Hulk returns with a broken leg and is slowly reverting more and more to his mindless monster mode. And within the Secret Wars series, we see the X-Men working side-by-side with Magneto, which will lead to Magneto taking over the responsibilities for the Xavier School in Uncanny X-Men #200. Give this series a revisit – it’s available in multiple formats (trades, hardcovers, and omnibus editions).